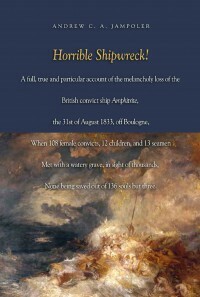 On August 25, 1833, the British convict transport Amphitrite, filled with more than one hundred women prisoners and their children, together with a crew of sixteen, left London for the convict colony in New South Wales. Less than a week later, all but three died when a savage storm battered their ship to pieces on a French beach—in full sight of hundreds of horrified onlookers. Inexplicably, the captain, John Hunter, had refused offers of aid from the shore. Sensational news coverage of the calamity prompted an Admiralty investigation to find out who was responsible. The suspicion was that Hunter and the surgeon on board rejected assistance because they feared the women would escape custody. Some blamed the doctor’s wife because she had refused to go ashore in the same boat with the convicts, so no boat was launched. Others accused the British consul ashore of criminal negligence on the night of the wreck. Still others charged French customs officers on the scene with inhumanity. Colorfully set in the political and social context of early nineteenth-century Great Britain, this account of the shipwreck is peopled with a fascinating cast of characters that includes John Wilks, debtor in exile and the Paris correspondent of a London newspaper, whose reporting inflamed public emotions; Lord Palmerston, the British foreign secretary; Captain Henry Chads, RN, the Admiralty’s investigator; Consul William Hamilton, who was the chief subject of the investigation; Sarah Austin, a British expatriate whose extraordinary heroism the night of the wreck merited an award; and her secret love, a fortune-hunting Prussian prince. Drawing from government records in England, Scotland, and France, and from contemporary newspaper reporting, Andrew Jampoler spins an authentic sea story that rivals the best fiction.